-Ideal for pick up hard to reach books, magazines, phones, papers, coins, envelops, trash, etc. Dikley's parcels are shipped by USPS or Fedex. Usually it takes 7-25 days for shipping. promptly and cannot be viewed on your order detail page. as soon as possible and we will do everything we can to help. 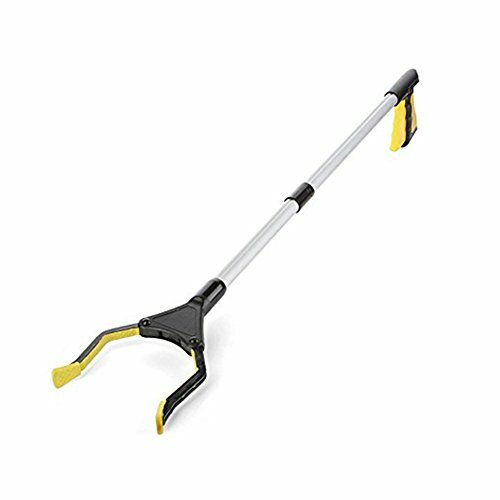 This heavy duty tool grabber grab allows you to pick up trash from the ground without having to bend over. Or to finally access items stuck on that pesky top shelf. Designed from lightweight aluminum and rubber crafted perfectly at a 32" length providing maximum reach without compromising on efficiency and comfort. Head rotates 180 degrees to reach from any angle. Foldable designed make it easier to store the tool when it not use. Ergonomic handle design with easy-squeeze grabbing mechanism, rubberized and molded to contour to your hand and fingers which provides a very comfortable grip. This grabber is perfect for picking up trash, retrieving loose change, grabbing out of reach items stuck in high places, accessing hard to reach areas under the furniture, etc. If you have any questions about this product by Dikley, contact us by completing and submitting the form below. If you are looking for a specif part number, please include it with your message.